For many children and teens, writing comes naturally. For others, the writing process needs to be taught in detail and, after the instructional and practice time, their writing becomes independent and continues to get better. But for some children and teens, writing never becomes easy and they avoid it like the plague. If you have one of these really, struggling writers, you likely now have about three different curriculums. Your other children are doing great with them. This child continues to struggle greatly with the process of writing a cohesive paragraph or composition. For several years I taught “gifted with a glitch” sixth, seventh and eighth graders in the public school. These wonderful teens and pre-teens were in my Resource Room Language Arts program because they were not writing at grade level. They were struggling in three areas that I needed to correct in one year: 1) Dysgraphia; 2) Spelling; and 3) Paragraph and Composition Writing. Prior to coming to my Resource Room, all of these students had been carefully taught for many years, using all the “regular” methods of writing such as: reading a passage and highlighting the main ideas to include in their writing; making a list of action verbs or colorful adjectives to use; outlining their topic; and using the “spider webbing” process. While all these methods are excellent, these students continued to be “non-writers.” They could journal just fine since that did not include any organization of thoughts, but rather just a conversational “rambling” which suited their style just fine. What I discovered is that “loose thought patterns” plague many of these children and teens, particularly those suffering with Dysgraphia, ADD or Auditory Processing Problems. They could not think in an organized manner and, therefore, could not write in an organized manner no matter how much practice they had using various workbook and worksheet methods of teaching. For them to be successful and not need to be in my remedial Resource Room for more than a year, I needed to come up with a method of teaching them writing that would move them forward to becoming fluent, independent writers. None of the curriculum I had available in the classroom or from catalogs had been working, so I developed my own strategy of teaching writing to this particular population. In developing this right brain Universal Writing Method, I kept several of my observations of these students in mind: 1) Because they could not transfer the “pieces” (left brain) to the “whole” (right brain), the detailed, sequential method of outlining absolutely did not work for them; 2) With their “loose thought patterns,” I needed to help them see the entire paragraph or paper in their head before they could write it; 3) Having them do “re-writes” or editing after they wrote their paper was totally unsuccessful for this group; 4) Correcting spelling errors on their paper was very defeating to them and; 5) Immediate feedback and motivating strategies were necessary. Praising work was not enough. Right Brain Webbing. Instead of the more piecemeal outlines or spider webbing, this enabled them to see the “whole” paragraph or composition before they even began the writing process. Modeling, Modeling, Modeling. I put the webbing on the board and together we came up with the topic sentence, three “blobs” of information about the topic, and then the conclusion. I helped them generate ideas (which felt a great deal like going to the dentist for a root canal at the beginning), and I wrote the trigger words on the webbing. I did not allow them to write on the webbing for many months. I continued to model this process until after Christmas. By that time, they “got it” and could easily do this process on their own with any topic of choice. I needed to show them that they could write any topic on a blank sheet of paper…not just out of a workbook, with the sentences given to them. Baby Steps. We wrote only one paper a week. Each week I did the webbing on the board, with their ideas, putting in all the transitional phrases. They wrote the paper from the webbing. The next week, before we did the webbing for the next paper, I would teach a lesson that was customized to the mistakes they had made in their previous paper. For example, if they wrote many “run-on” sentences the week before, prior to doing this week’s paper, I taught them how to avoid run-on sentences. If they were putting many adjectives in a sentence without commas, I taught that skill. This way I could “shape” their writing when they were approaching the assignment, rather than after they had written it. This method proved to be so much more successful for them. Also, each week I would add another “example,” or thought to our “three blobs of information” about the topic we were writing. As a result of these baby steps, by the end of the year all my students were writing four page papers on their own, by just being given a any topic. It was impressive and easy. The next year, they didn’t need my “remedial” writing method anymore. They were ready to use any of the very good writing methods that used more of a “polishing technique” in their instruction. They had become writers. It is amazing to me how many students I hear from who are in college now, who tell me that they are majoring in journalism because they like writing so much. How good is that! Why do I call this the Universal Writing Method? I do so because I have seen it always work, no matter what the struggles of the child or teen. I have found that after they have learned how to “think” while writing, then they can move on to all other good writing programs readily available. 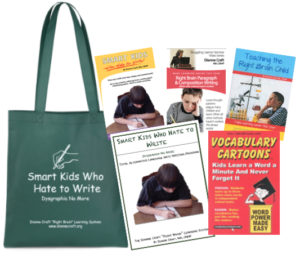 Over the years, many teachers and homeschooling parents have used this easy Right Brain Writing method to help their child or teen organize and write paragraphs and compositions. No other writing curriculum is needed during this time…whether you use it for six months or a year. It teaches you how to work with non-writers all the way up to ninth grade writing. The best way to learn how to use this writing process is to see this method demonstrated for beginning writers (those not even writing sentences yet), intermediate writers (those ready to start writing paragraphs), and advanced writers (those moving on to sophisticated paragraphing and composition). This demonstration is available on the new “Right Brain Paragraph and Composition Writing” DVD available on my website. The Right Brain Paragraph and Composition Writing DVD comes with the very detailed Right Brain Writing Instructional Booklet that you can use all year. This is a “Teacher Training” video, showing you how to use this method with your struggling writer (and all of your beginning writers at home, if you wish). There is no curriculum to purchase. This is just a unique teaching method. It only requires you, using these new teaching strategies, and paper. Generally, after one year of using this writing method, students can go on to any other language arts writing curriculum. NOW AVAILABLE on Our Website Store– Dysgraphia Package: Remediate Language Arts Curriculum for the next school year! Easily correct your child’s symptoms of Dysgraphia and a blocked writing gate while also implementing a WHOLE NEW healing teaching method. The information in this article should not be construed as a diagnosis or medical advice. Please consult your physician for any medical condition and before adding supplements or changing a child’s diet. Dianne Craft has a Master’s Degree in special education and is a Certified Natural Health Professional. She has a private consultation practice, Child Diagnostics, Inc., in Littleton, Colorado.